Discussion in 'iPhone and iPad Games' started by Boardumb, Jul 19, 2017. 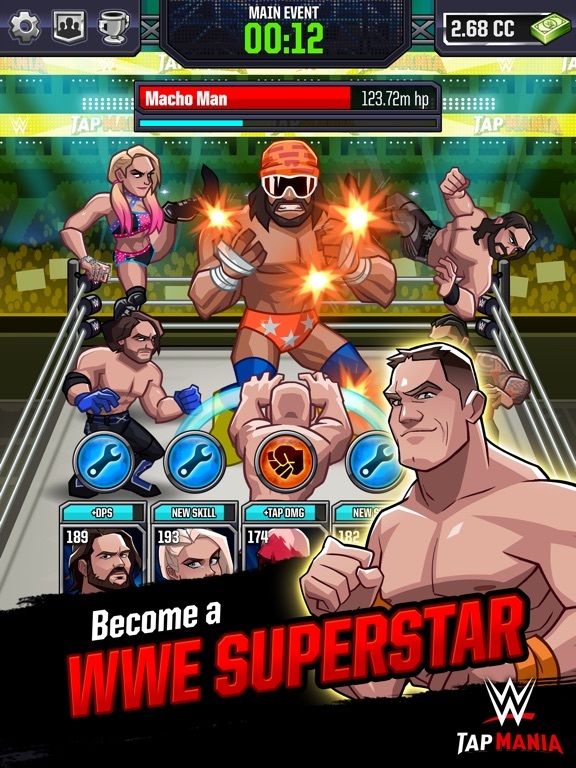 Unleash your ultimate team of Superstars in WWE’s new, fast-paced game, WWE Tap Mania! 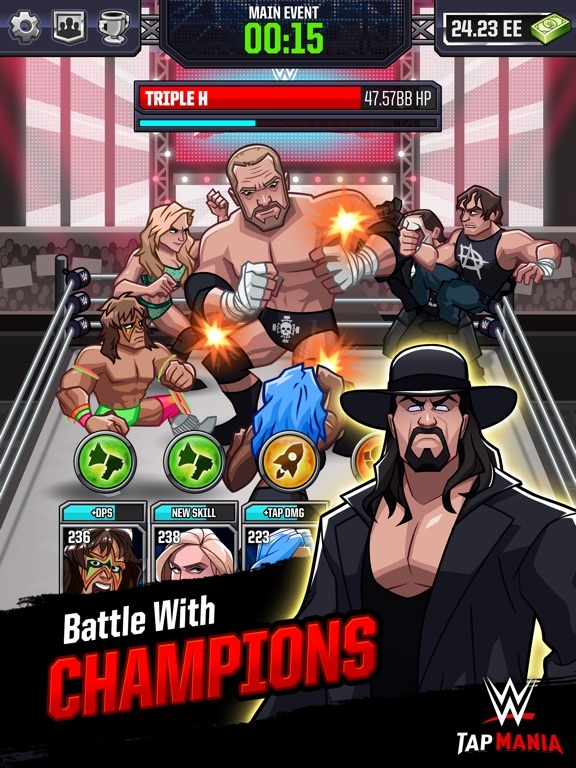 In WWE Tap Mania, the action never stops. 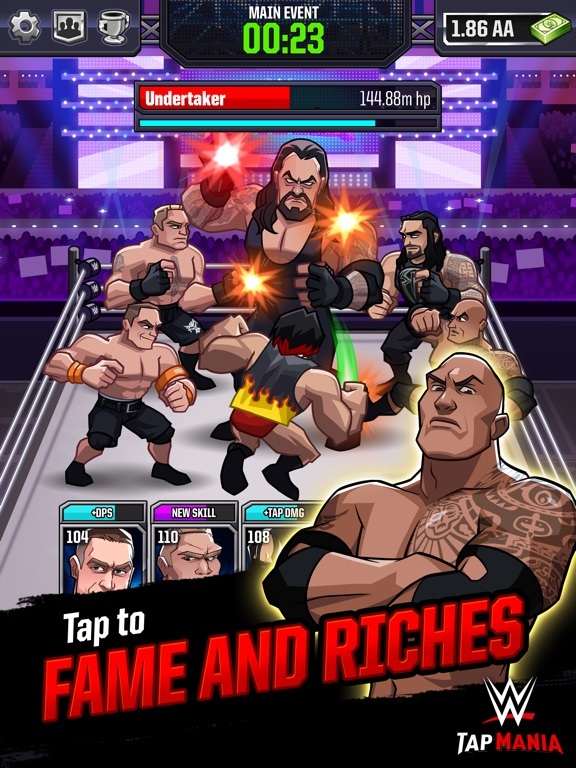 Become a WWE Superstar and battle alongside WWE’s greatest Superstars and Legends. 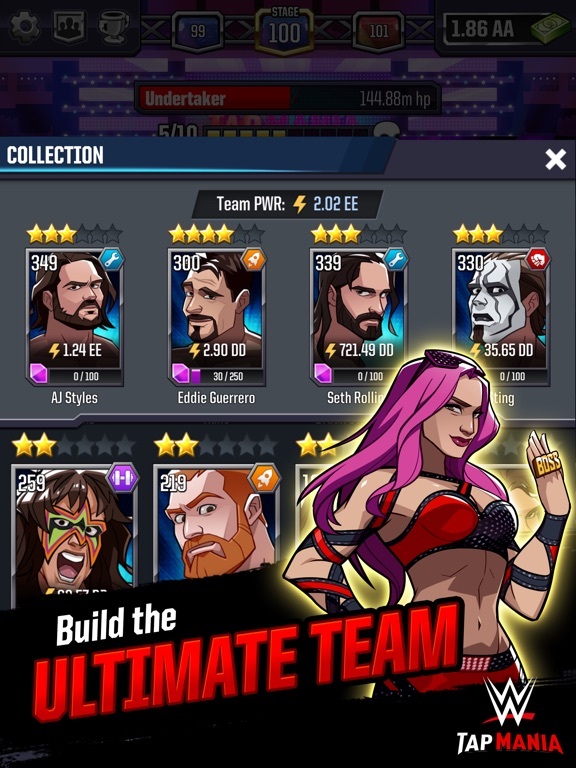 Collect Superstar cards, build your deck, and rise up to become the WWE Champion. Get in the ring and unleash the mania! 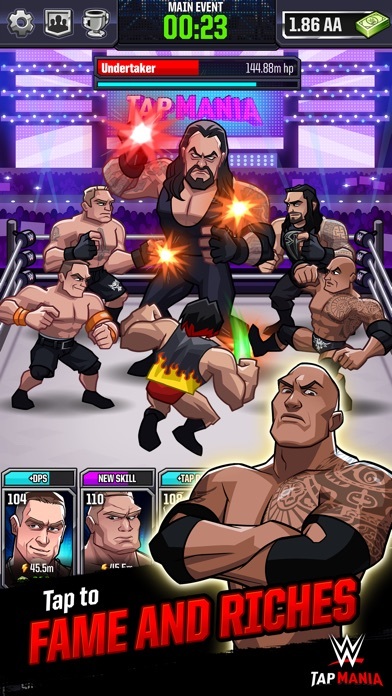 GET IN THE RING - NON-STOP ACTION as you battle the best, build your team, and take on the world - CREATE the ultimate team from WWE’s greatest roster of all time - EASY TO PLAY -- tap to attack and unleash devastating signature moves - STRATEGIC GAMEPLAY -- tap into the rich history of the WWE to make an unstoppable team with the unique type and affinity systems - LEVEL UP to increase your power and unlock each character’s unique skills - PLAY-BY-PLAY by the WWE’s Michael Cole and Corey Graves UNLEASH THE MANIA - TONS OF MATCHES -- battle in the main event against WWE’s greatest Superstars - COLLECT WWE Superstars and Legends for free as you play - FEATURING The Rock, John Cena, Undertaker, Brock Lesnar, Triple H, Roman Reigns, AJ Styles, Charlotte, The Miz, Randy Orton, Sasha Banks, Dean Ambrose, Eddie Guerrero, Ultimate Warrior, and many more! 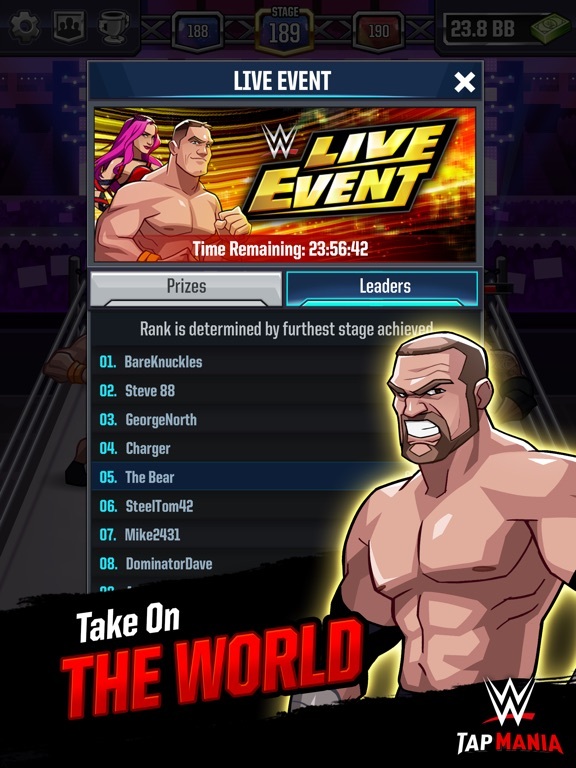 - EARN WHILE AWAY -- your team never stops fighting so you’re always earning, even when the game is closed -DOMINATE IN LIVE WWE EVENTS -- rule the leaderboards in daily live events based on WWE’s signature live television and PPV events: RAW, Smackdown Live, Royal Rumble, SummerSlam, WrestleMania and more BECOME A WWE SUPERSTAR - PERSONALIZE your character by creating your own signature move and play style - CUSTOMIZE your Superstars' powers and abilities with perk points - COMPLETE challenges, objectives, and achievements for epic rewards - COMPETE WITH FRIENDS to prove who’s the best IMPORTANT, please read: This app is only compatible with iPhone 5 or later, iPad Mini 2 or later, and 3rd Generation iPad or later. ----- © SEGA and/or The Tap Lab, Inc. SEGA and the SEGA logo are registered trademarks or trademarks of SEGA Holdings Co., Ltd. or its affiliates. All WWE programming, talent names, images, likenesses, slogans, wrestling, moves, trademarks, logos and copyrights are the exclusive property of WWE, and its subsidiaries. All other trademarks, logos and copyrights are the property of their respective owners. © 2017 WWE. All Rights Reserved. Played the ca version in soft launch for a bit. It asks for in app purchases quite a bit but it's kinda fun for a tapper. The wall comes up quick though and resets don't do much to progress you so I didn't get far before I got frustrated. Seems very liberal with giving out free premium currency- I have the equivalent of $10 worth after 30 minutes of play. Most seem like 1 time rewards, so I expect that to slow down significantly. I'm enjoying this game, been playing a LOT since it's soft launch both in Philippines and Canada. The game was much more generous previously but has since been balanced. Before the Jeritron 6500 update that gives a default 3x Cash boost for watching an advertisement, there used to be a wheel you could spin unlimited times to win either 2x, 3x or 4x Cash boost reward. You also used to be able to stack the Cash boost up to 24 hours but it's been cut to 2 hours per advertisement now with just 3 advertisements at a time for a total of only 6 hours boost. The game is quite generous in giving out some Character Shards, once you reach Stage X you fight the boss of said stage to I think unlock said Character or Shards. The events seem kind of rewarding though it's slow to gather Character Shards. I've been considering buying the Permanent 4x Jeritron 6500 but not really sure yet if I want to or not. You are a wrestler, you tap to deal damage from your character. 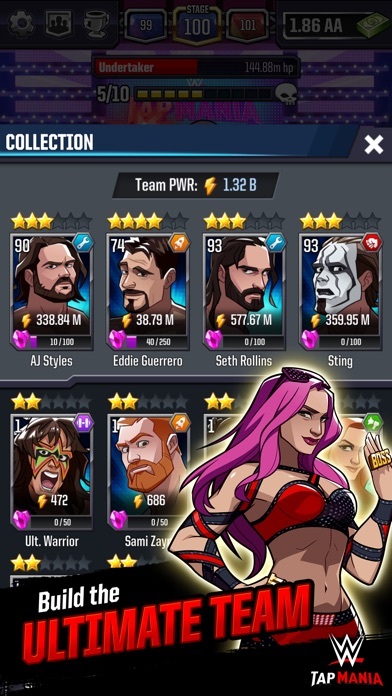 As you progress you unlock other wrestlers and they automatically attack and have special attacks, you can tap to set off and they will then cool down and be ready in X amount of time. Also I did go ahead and purchase the 4x Jeritron 6500 Cash Booster works the same as before but instead of getting 3x Cash I now get 4x. Also Once you buy it, it unlocks a 5x Cash Booster you can buy for another $4.99 haven't bought that 'yet' lol. Thanks so it's like the crusader quests kinda game. Crusader's Quest is a Match-3 Gatcha RPG, while this is a clicker game, so there are probably more apt comparisons. Does the game cloud save? The last clicker game Sega released which was a crazy taxi one didn't have this function which I find hugely disappointing. 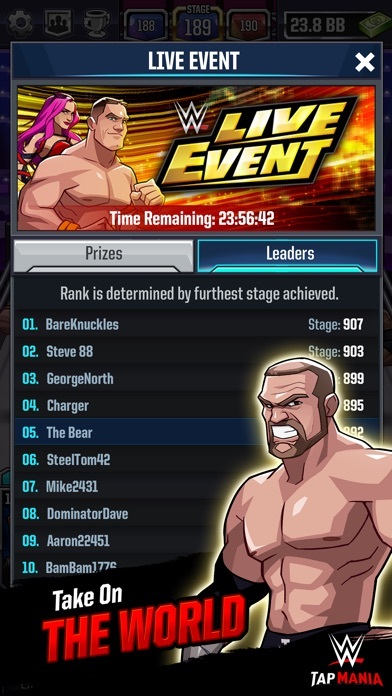 Was going to write this off... a tapping game with wrestlers? But it's actually pretty good. I love the art style and so far doesn't seem to greedy or unbalanced. I've played a ton of idle games, some of them you need a calculator to optimize progression (not fun to me) or you have to rely on pure luck for artifacts/items to drop or you fall behind but I don't see any of that here yet. Plus the Lead Designer is a super active moderator on the game's subreddit and very helpful. You can tell he really cares about the game and is a true WWE fan. I am not sure if it has cloud save, but I know it saves to Game Center. That's good enough, just want to be able to play the same profile on multiple devices. Forgot to check this thread to see if it was recently mentioned, but if not for anybody that is interested. The Sub Reddit for this game is starting to take off a bit, with more activity on it than usual and the developer of the game is quite active there as well here is a link below. Also somebody made a Discord channel where some people have also been active and the developer is active there a lot as well, you can check that out below is a link to the reddit thread for the discord.